Volunteers at one of several Bike To Work and School Day stations. Celebration stations. This one located at Railroad and Holly in downtown Bellingham. Someone baked a cake. 2007 is the tenth anniversary of this festive event. Meet lots of interesting folks as people get out of the isolation of their cars and bicycle more. 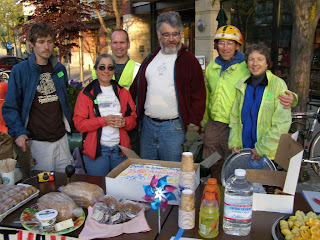 Celebration stations cheer on the bike commuters as they pass. 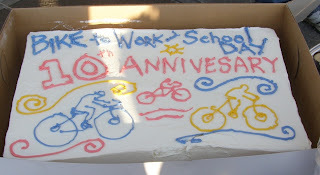 Some will stop for refreshments and conversation on the annual Bike To Work and School Day which was May 18 this year. It encourages people to do more biking throughout the year. See a video of celebration station. Approx. 1 minute. Banner at after party in courtyard of Boundary Bay Pub. 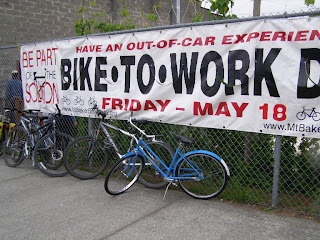 Happy Bike to Work Day, everyone. Sorry, but I did not bike to work, as I don't work! That's good excuse! Just moved to the east coast, so I'm getting my bicycle ready for riding!